A 52 year old patient presented with thrombocytopenia discovered on a haemogram performed about 2 years before presentation. The first haemogram performed as a part of a health checkup showed a platelet count of 81 X 109/L with an MPV of 13.1fl. The haemogram had been performed on multiple occasions since then and the platelet count has been reported by different laboratories to be between 63 X 109/L and 103 X 109/L. The haemoglobin, red cell indices, total and differential WBC count was normal. The patients had no personal or family history of bleeding. He had undergone an appendicectomy and a tooth extraction without excessive bleeding. 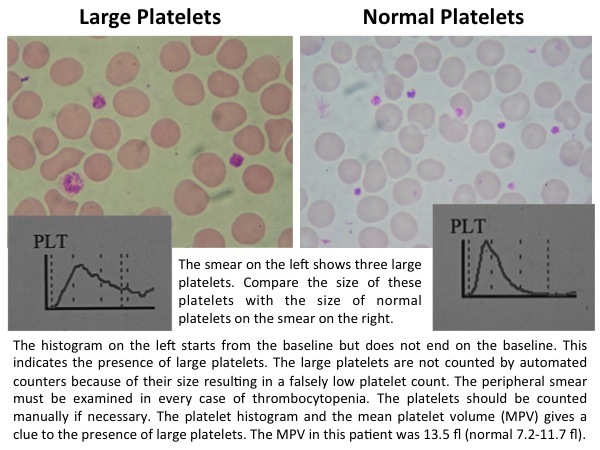 The figure below shows the peripheral smear and the platelet histogram of the patients compared to a normal individual. The platelet count performed manually was 130 X 109/L. The patients was a native of North India. Mild thrombocytopenia (platelet count between 100 X 109/L and 150 X 109L) is found in 26% of blood donors from eastern India and 18% blood donors from northern india (HVK Naina et al. Journal of Thrombosis and Haemostasis 2005; 11:2581-2). Automated counters have limitations in evaluation of thrombocytopenia. The peripheral smear must be examined in every patient with thrombocytopenia to exclude giant platelets, platelet aggregation and platelet satellitism that may cause thrombocytopenia.